The news of an exciting new footwear collaboration delightfully surprised the fashion world recently, and now I’m sighing for a coveted pair of Peter Pilotto for Ancient Greek Sandals. The fun prints and colors on these sandals lend an extra spring in your summer step and beautifully complement a simple white cotton dress (a summer staple). Unfortunately, the brilliant designs are part of the Resort 2016 collection and won’t be out until November, so all that’s left is finding a tropical destination for winter vacation to show these babies off! As Miranda Priestly so cleverly articulated to Andy Sachs in The Devil Wears Prada, you don’t have to be a top model to wear runway looks, but re-imagining the pieces we see on the runway is not always easy. 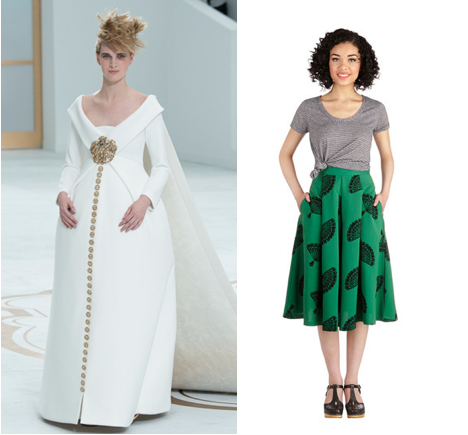 Let’s pretend Miranda Priestly chose us to go to Paris Fashion Week as we attempt to interpret the Fall 2014 Haute Couture looks that appeared on this week’s runway. Unless you’re trying to reenact van Eyck’s Arnolfini Wedding, Chanel’s Fall 2014 skirts are probably not for you. To go from Matronly to Mod, try a high-waisted full skirt that hits the knees. This one from ModCloth styles perfectly casually with a black cropped sweater for fall, or dress it up with a knotted silk button-down. Beads aren’t just for flappers and fancy dresses, they’re for fall! 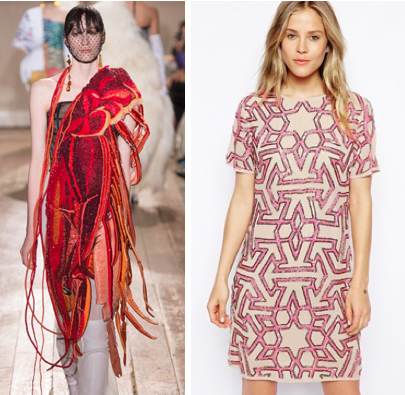 Turn the beaded looks seen on the Maison Martin Margiela runway into an everyday look with a beaded shift dress. This one from Asos is perfect for day and night because of its neutral background and subtle metallic beading. I love fringe because it’s so eccentric yet somehow so versatile too. You don’t believe me? I bet you have a fringed scarf, fringed shorts, and maybe even a fringe bathing suit if you followed this season’s swimsuit trend. Well the possibilities don’t end there! 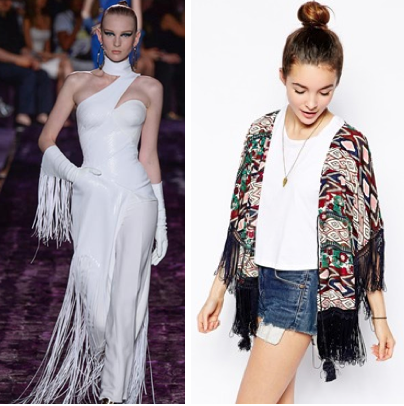 This fringe kimono from Asos adds a touch of effortlessly chic to any outfit with its casual shape and geo-tribal print. All the extravagance and theatrics of Haute Couture can sometimes cause haute confusion, but don’t let that intimidate you. Let your style be your guide and the looks will work for you!